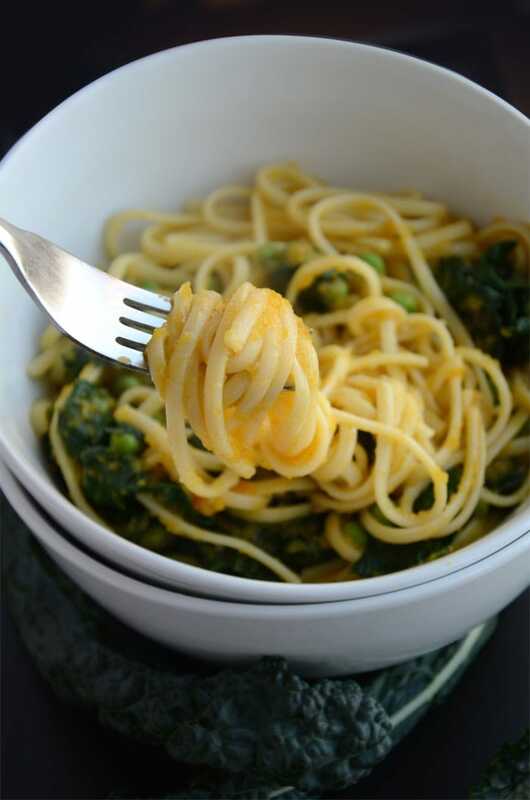 The changing weather is making me crave all sorts of creamy, comforting dishes just like this vegan butternut squash pasta. I don’t normally crave pasta, or even eat much of it, but lately I have been and who am I to argue with a pasta craving? Since fall has seemingly decided to show up, I need all these carbs for running in the rain anyways, so, it’s all good. Whether you’re looking for a lighter noodles, a gluten-free option or less carbs, one of those options will work for you. 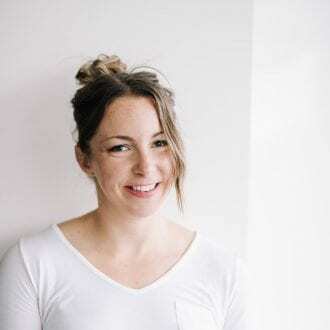 My favourite pasta alternatives are made by Explore Cuisine, they have a ton of different nutritious and high-protein options. They use ingredients like black beans, edamame, lentils and mung beans to make their high-protein, grain-free noodles. I like brown rice pasta too and chickpea and quinoa pasta are also excellent gluten-free options. 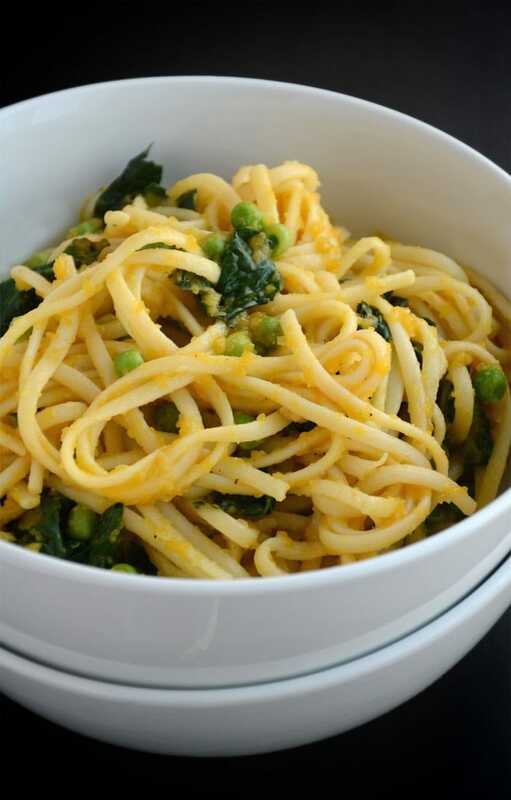 You can use spaghetti, linguine, penne, fusilli or any other pasta variety you like. You could also serve the sauce over spaghetti squash “noodles” for a double squash dish! The sauce is versatile and could also be paired with steamed broccoli, roasted veggies or cauliflower rice. This dish is really easy to make with simple ingredients. The hardest part is preparing that darn butternut squash! These days, I often buy prepared butternut squash for that very reason. Cutting into, peeling and scooping out the seeds of a butternut squash is probably my least favourite kitchen task. That being said, butternut squash is well worth the effort for it’s subtly sweet and satisfying flavour, beautiful texture, nutrition and versatility. To make this creamy pasta dish, all you need to do is cook up the butternut squash with onions, garlic and vegetable stock. 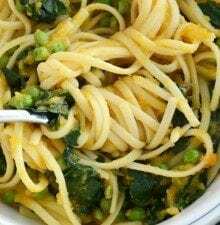 Blend until smooth and creamy and then mix with you pasta of choice, kale and peas. It can be ready in about 30 minutes, is completely plant based and can be made ahead of time for food prep and enjoyed all week. 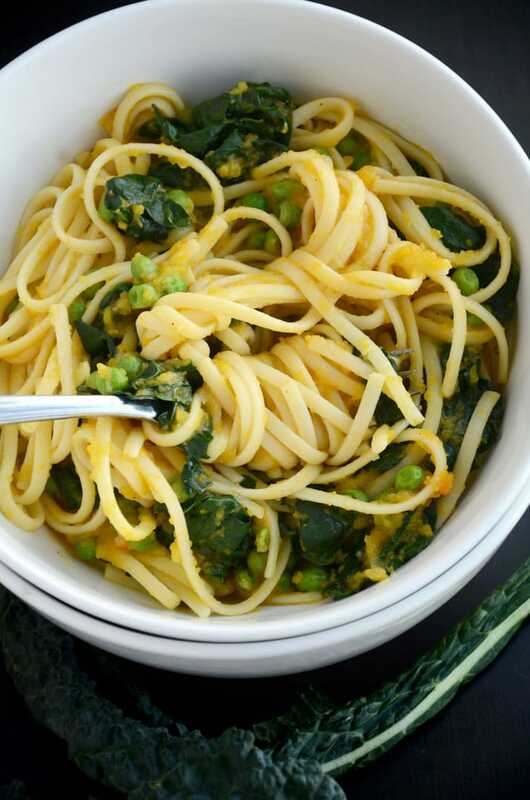 This creamy vegan butternut squash pasta with peas and kale features a delicious sauce made from butternut squash and vegetable sauce. It’s comforting, satisfying and perfect for chilly days when all you want to do is curl up with a bit bowl of pasta. Heat the olive oil in a large pan. Add the onions and garlic and cook for 3-4 minutes. Add the butternut squash, salt, pepper and red pepper flakes. Cook for about 5 more minutes. Add the vegetable broth. Bring to a boil and then reduce to a simmer. Cook until the squash is soft, approximately 20-25 minutes. The liquid should reduce by about half, but add a bit more if needed as it cooks. While the squash is cooking, cook the linguine according to package instructions in a large pot of salted water. Once it’s cooked, strain while reserving 1 cup of the cooking water. Once the squash is cooked, add the mixture to a blender and puree until completely smooth and creamy. Add the puree back into the pan. Add the kale, peas, pasta and the 1 cup of reserved liquid. Cook for 5-10 minutes until the kale is soft. 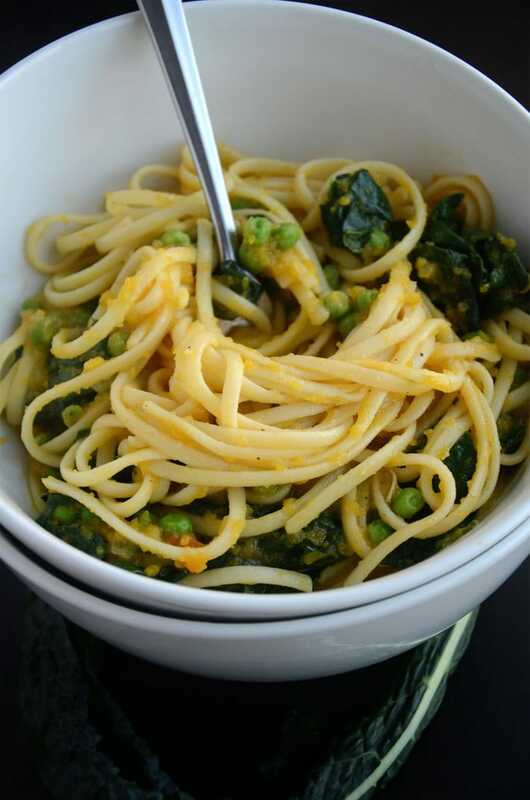 Adapted from Creamy Butternut Squash Linguine with Fried Sage by Cookie and Kate. My boyfriend has been keeps bringing butternut squash home from work – adopting them from a coworker’s garden. I can’t complain, but I’ve go so much squash at this point I could certainly use some inspiration. This sounds perfect! I made this dish last night using gluten free brown rice pasta and it was amazing. It was such a nice change from the typical pasta and tomato sauce. My husband really loved it too. Thanks!